Another UFO sighting has sent most conspiracy theorists into a frenzy. The unidentified flying object was spotted moving over the rogue nation of North Korea. The live-feed of the International Space Station (ISS) enabled the eagle-eyed viewers to spot UFOs moving over the country. The copy of the video was posted to YouTube. It shows a bright object zooming over the land in D.P.R.K. 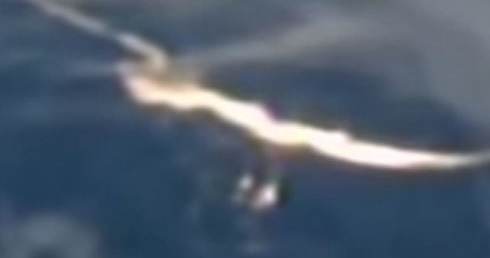 The white object can be seen shooting across the country in the footage. YouTube channel UFOmania said that the UFO entered the upper layers of the atmosphere above the communist nation. It added that the object was caught on a camera installed on the International Space Station. Some believe the mysterious object is a UFO of alien origin, while others think it could be a military craft. Many people are convinced of the authenticity of the video. YouTube user Frank Mccracken think it cannot be a plane. Another commenter onigk612 believes it is a UFO because it is an unidentified flying object, but not an alien in origin. He thinks it is a missile test. Others have a more natural explanation for the strange sighting, saying that it is probably just a Sun’s reflection.